Choose a Product or service that you can gain detailed information from - Give a detailed explanation of the principles of marketing that are applied to the development of this product or service. 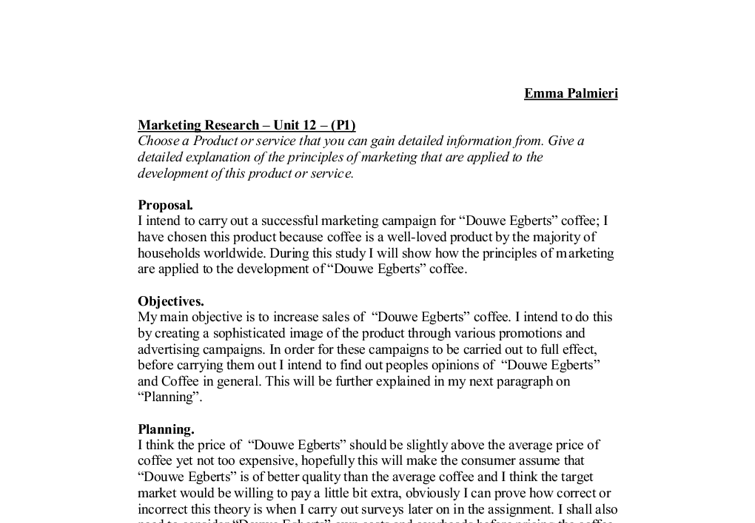 Emma Palmieri Marketing Research - Unit 12 - (P1) Choose a Product or service that you can gain detailed information from. Give a detailed explanation of the principles of marketing that are applied to the development of this product or service. Proposal. I intend to carry out a successful marketing campaign for "Douwe Egberts" coffee; I have chosen this product because coffee is a well-loved product by the majority of households worldwide. 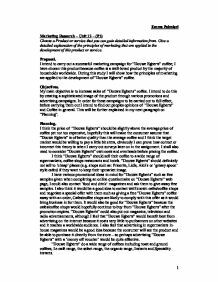 During this study I will show how the principles of marketing are applied to the development of "Douwe Egberts" coffee. Objectives. My main objective is to increase sales of "Douwe Egberts" coffee. I intend to do this by creating a sophisticated image of the product through various promotions and advertising campaigns. In order for these campaigns to be carried out to full effect, before carrying them out I intend to find out peoples opinions of "Douwe Egberts" and Coffee in general. This will be further explained in my next paragraph on "Planning". Planning. I think the price of "Douwe Egberts" should be slightly above the average price of coffee yet not too expensive, hopefully this will make the consumer assume that "Douwe Egberts" is of ...read more. It would also be good for "Douwe Egberts" because the cafes/coffee shops would hopefully continue to buy from "Douwe Egberts" after the promotion expires. "Douwe Egberts" could also put out magazine, television and radio advertisements, although I feel that "Douwe Egberts" would benefit best from advertising on the internet because it costs very little to put banners on other websites and it reaches a worldwide audience. I also feel that advertising in supermarkets in-house magazines would be a good idea because the consumer will see the product and be able to purchase it directly from the store - so perhaps advertising "Douwe Egberts" with a 'money off voucher' would be quite effective. "Douwe Egberts" do a wide range of coffees including roast and ground coffees, Le caf� range, the select range, the organic range, Instants and Speciality instants. "Douwe Egberts" packaging will be of high quality, it shall be packaged in a glass jar with a glass lid so it looks of a higher quality than most coffees that have plastic lids, the wrapping on this glass jar shall be made of glossy coffee coloured paper with gold lettering - this shall vary with different types of coffee. ...read more. I mentioned in an earlier chapter that I intend to get cafes to give away free samples of "Douwe Egberts" coffee, I could also ask them to give out a small card with this free sample asking what the consumer thought of the coffee and this could be sent back to the company. Analyse and evaluate data. When all data is collected I think it would be best to put it into a simple graph so the results can be clearly seen, I could also use pie charts or scatter graphs for this. From these graphs I should be able to see whether there is actually room in the market for "Douwe Egberts" coffee, what my target audience is and what price I should give "Douwe Egberts" coffee. Communicate findings. To communicate my findings I shall firstly write up a report on all information that I have found. I shall then go about planning a small presentation. To convey the information clearly I could use a number of aids to help me such as OHP, diagrams on the board and handouts. I should also prepare a section at the end of my presentation for my audience to ask questions, I should therefore prepare possible questions and answers I could give to them. 1 ...read more. Controllable and 2. Non-controllable. Non-controllable communication consists of marketing messages that occur as a result of word of mouth, personal recommendation or a consumer's overall perception of a particular product or service. This may depend on how long a family has been using the product/service. "In an act which French anthropologist Claude Levi-Strauss (1966) called bricolage (from the French word for the workman who assembles things from odds and ends)," (Fowles, 1996, p.5) the creative team working on the Energizer Bunny created it as a friendly symbol of spontaneity, rejuvenation and perseverance. * The SWOT Analysis can be used in conjunction with the P.E.S.T Analysis. * The SWOT Analysis is a very popular 'Marketing Strategy' and is used by many businesses and marketing students because it is quick and easy to learn. This man is obviously a rich business man, this is shown by his gold fountain pen, his diary and his gold marriage ring, and is wearing an expensive looking suit. This gives the reader something to aspire to. It makes them want to be perceived like the man in the picture, a success in life. be further defined by their access to and amount of time spent with any given interactive technology. These measurements are better described in the interview section that follows. The future of interactive marketing The nature and contours of the advertising message itself is expected to drastically change. * 2.2 How the information was analysed After gathering all information from the Internet, journals and textbooks. It is necessary to look and read the facts and figures for Internet usage and analyse this in terns of online marketers. These Facts and Figures are very important to understand so as to draw any conclusions and recommendations from. When I was studying at university I didn't even want to really work into the media. I was studying history as a major and I worked as a waitress in a caf� and I had been doing a work experience at a natural history museum.